As I traveled up the interstate toward Washington, D.C., my colleague suddenly realized that he had left some items behind in the hotel room where we had stayed. It was too late to return to the place, but he really wanted the items back. “Just ask!” was the motto on the hotel brochure. It was a reassuring invitation that this hotel was different from others, and would surely make that extra effort to help us out. It was a matter of just asking. My colleague called the receptionist at the desk to ask if the items had been left behind and he confirmed that the items were indeed there. It was now the time to “just ask.” Credit card in hand, he asked the receptionist if he might package them up and send them back. Certainly this kind of thing happens all the time. My colleague asked if he might at least package the items up, but was told that he could not do it. We would have to arrange the packaging as well. The next calls were to two parcel services to try to arrange a pickup. The first call was immediately routed to an answering machine that listed all the options. Since no option seemed to fit our special need, my friend asked for a real live operator to explain his unique problem and find a solution. “Just ask!” also did not seem to work here. My increasingly exasperated colleague was asked if the items were in a package, which again seemed to be an insurmountable problem. He was then told that the operator could not initiate a pickup and that he would need to visit the website and generate a label for the driver to pick up his still unpackaged items. He was further informed that generating a label would require the use of an established account which he did not have. Without a package, a label or an account, my colleague hung up. There was really nothing we could do. He called another service and found the same restrictions applied. We simply did not fit into the system. His items seemed to be lost forever. Such a dilemma is indicative of the impersonal nature of business in many areas of our economy. There is a cold, machine-like system in place where the essential human element is left out. It is part of what I call the “frenetic intemperance” of our times where everything must be done instantly without regard for those complicated relationships that are part of commerce and culture. People simply don’t want to get involved in such things. That normal desire to help others is somehow suppressed in the quest for efficiency. In our plight to get the items back, we started to look at other, more human options. Suddenly, it occurred to us that we might ask someone we knew to help us. The night before leaving we had met with a priest at an event we were attending at his parish. We had not known him before, but we were impressed by his solicitude for us. We had no doubt that this was a way out. When you need help, call a priest. Just ask…. Father answered the phone and was glad to hear from us. He had no difficulty in resolving our problem. He handed the phone to his secretary and asked her to solve a problem which mega mailing operations and our hotel could not. The secretary happened to live right next to the hotel. 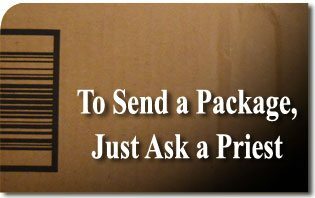 She offered to stop by, package the items, and send them by mail to the address indicated. My colleague received the items in good order and took note of the $10.15 shipping cost, which did not include the price of the box itself. He also noticed there was no bill inside. This entry was posted in Return to Order and tagged answer, ask, behind, charity, Christian, culture, customer, frenetic, intemperance, just, Just Ask, machine, Order, package, priest, problem, resolve, return, Return to Order, service, solicitude, solution, supernatural by John Horvat II. Bookmark the permalink.